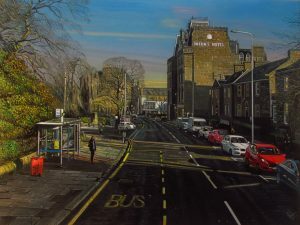 I’ve lived in Dundee for 16 years now and have often felt inspired to paint the city. The first body of work I painted at art school was of local cityscapes. But in the last five years I’ve began to really focus on developing a larger body of work based on my experience of living here. Initially the work was based on landmarks and places of interest – I was just kinda feeling my way around ideas – but since then, the work has developed – people and everyday scenes have become more present. I now see my work a documentation of life in city at a time of change. Light and shadow are very important in these works – the light in this part of the country is very evocative and can set a mood or help create a narrative. The light in summer here is very crisp and great for capturing the clarity and depth of detail which is so well received in my work, but the late autumn sky is one of my favourite backdrops. It’s often very sunny here in the autumn and the low golden light creates raking shadows in the architecture. I try to capture the light of all the seasons if I can – blue shadows on snow can be seen in my paintings such as Whinny Brae. The colourful early winter sunrises across the Tay are a feature of my work that I often re-visit. I still think this part of the country produces some of the best sunrise/sunsets I’ve seen – especially in early November…a time of year I look forward to. The other thing I like about Dundee is the textures of the city. Unlike some cities, it’s not to clean and unified – you can tell it’s been developed over and over for years. I like how the roads are a patchwork of resurfacing and colours. The yellow and white paint markings are interesting features – I may be the only person in this city who likes to see the roadwork signs and cones…they add a hint of colour and vibrancy. Hopefully my role as the artist is to help folk see beauty in things that may normally be overlooked. I also like the textures in the old tenements and how the layers of time have a clear effect on them. When I go to some other cities I can appreciate the unified style but they don’t always inspire me as an artist (in respect to the things I like to paint) – but the character of Dundee always does. Other cities I feel have the same grasp on me are Venice and Amsterdam; places I have also built up a body of work from. Although they are miles apart, I think it’s the light, character of architecture, and the textures that make them similar. The places I paint depend on different factors and I leave that to chance. I used to take long walks in the city with my camera and still do, but now I like to keep a small compact camera with me at all times. This way I can capture things randomly, day-to-day, and build them into paintings. Even when I get the bus now, I sit upstairs at the front. I’ve captured many scenes this way which have went on to become paintings – such as Nethergate (above). The places I mainly paint are Stobswell, Broughty Ferry, Hilltown, West End and the city centre, mainly because I have connections to them; memories through living there, working there, etc. I think these areas evoke the quintessential character of Dundee that lends itself so well to my work.